IN WHAT is becoming something of a Christmas tradition, Oxford Gene Technology has launched an interactive online game aimed at the laboratory. This year’s game invites players to build a snowman using a simple online interface, and then to share their creation with friends and colleagues and enter it into the company’s gallery. OGT says it has created this online app instead of sending out seasonal cards and will be making a donation to charity. Snowmen can be built using snowballs of a variety of sizes, and adorned with a selection of clothes, accessories, and natural objects (sticks, stones, vegetable marrows, etc). There is also a selection of laboratory equipment including safety gear, pipettes, test tubes, and a white lab coat. Our own entry, shown here, used a number of conical Erlenmeyer flasks in a skittle arrangement, with the snowman bowling them out. Well, it seemed funny to us at the time and was prompted by the collection of lab-related collective nouns which gave us a giggle a few months ago. Oxford Gene Technology is enticing entries to the gallery with a chance to win a Kindle Fire, which the company says will be awarded to the entry with the best-dressed snowman. 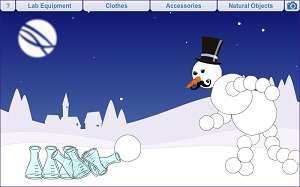 To play the game, click on the ten-pin bowling snowman above. Copyright © 2019 LabHomepage. All Rights Reserved. The Magazine Basic Theme by bavotasan.com.